Well i’ve been looking at a breath tester for your personal blood alcohol level – one which you blow breath into which you can carry round with you on a night in the bar. 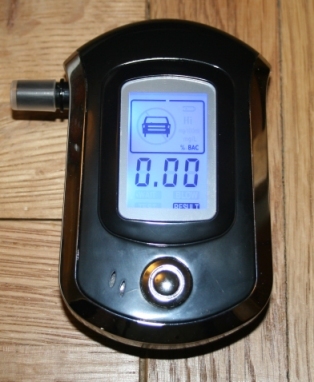 When it comes to alcohol in the blood, and drink / driving, to be quite honest, I think there are a couple of points which need to be raised about the concept of a personal type of gadget like this. In my personal opinion, I think it’s better to not have anything alcoholic to drink whatsoever before driving. But, for those who would disagree, this may be of use. Point one would be the validity of the reading from such a tester though. I am fairly certain that police breath testers are likely to be somewhat more sophisticated than anything available to the public – but I may be wrong. However this uncertainty would lead me to revert to my original statement of preferring not to have any alcohol level at all in my breath or blood. Thus being 100% certain of what any outcome would be should I be stopped by the police and checked by having to blow into one of their breath testers at the roadside. The next point I would like to raise is that you also need to be very attuned to the current law – which does change from time to time. A reading from a personal blood alocohol level tester would be meaningless if you weren’t up to date with your legal details! However – there is a fantastic use for this, and that is that you can use it to impress your friends at the pub or party and perhaps have a good laugh at the “differences” between party goers as the night goes on. You can believe the accuracy of the readings for the purpose of having a laugh whilst staying out of your car – nothing wrong with that, and if the reading on one person in particular shows I highest blood alcohol level than others – then there are jokes to be made for sure! Here is a picture of the tester I am talking about here. 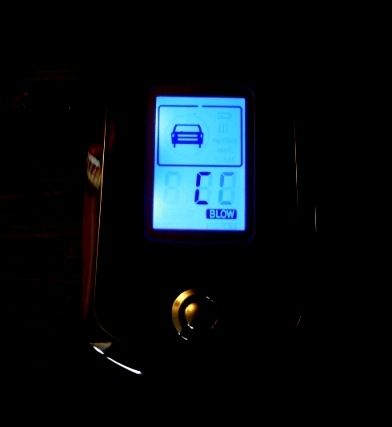 You can see that the portable breath tester is back lit so that readings can be taken even when in the dark. It requires 3 x AAA batteries which do not come in the kit. 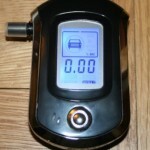 To do the breath test, you simply press the silver button and wait for the machine to warm up – a message is displayed on the screen to indicate when it becomes ready to accept a sample of breath. Then, you blow into it until it shows a “TEST” message and then wait whilst it does it’s actual testing. The result is then displayed as a % BAC which is how much alcohol is in your bloodstream. Local laws on how much is permitted should then be taken into consideration before driving, although I personally wouldn’t rely on any kit like this and prefer to stay 100% sober instead of taking the chance. The image below shows how clear the readings are even in the dark. I’m going to have a laugh with this personal blood alcohol level testing device by taking measurements of the levels in my wife after she has had varying amounts of wine. I will attempt to identify the accuracy of the machine by considering the time period of alchol ingestion, the strength of the wine and the quantity consumed. There are many other factors, including how much food is in the stomach, but over time I should be able to build up some kind of average variance and look at the outputs to get an idea of how the tester works in more detail. Another reason I don’t drink and drive is the food content aspect. For example, I may get a low reading when I leave the bar having had my last drink, but then the level may rise as the final intake is transferred into the bloodstream, this is far too complex an issue to take chances with – bearing in mind peoples lives are on the line aswell as your driving license! Great gadget for party fun though and a topic of conversation. I wouldn’t use it though for anything other than talking about and having fun – certainly not to rely on when it comes to driving safely. Strobe Disco Lights for your House Party!